Benjamin Franklin was the Founding Fathers of the United States. Franklin was an author, printer, politician, postmaster, scientist, inventor, humorist, civic activist, statesman, and diplomat. He was the icon of America. 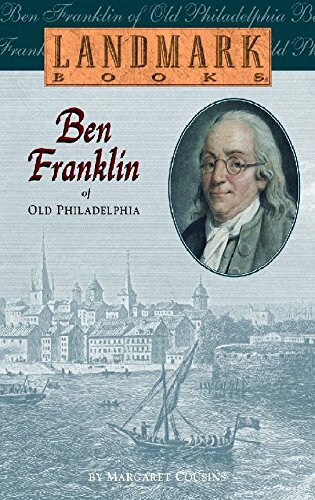 If you want to read his biography book, we have listed some best popular book by Benjamin Franklin. Benjamin Franklin was a prolific inventor and scientist. 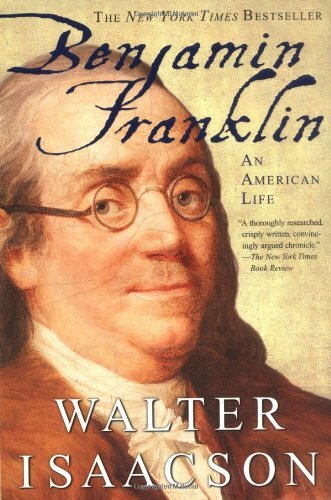 If you would like to know the biography of Benjamin Franklin then Benjamin Franklin: An American Life is a wonderful choice. 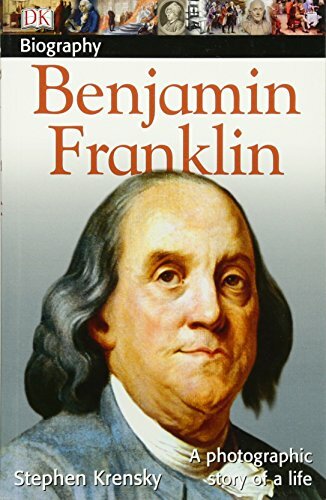 This book describes how the hardworking Franklin became at age 24 the most successful printer in Pennsylvania and how by 42, with the help of Poor Richard's Almanack, he had amassed enough wealth to retire from business. Here is truly one of the most extraordinary lives imaginable, a man who, with only two years of formal education, became a printer, publisher, postmaster, philosopher, world-class scientist and inventor, statesman, musician, and abolitionist. Franklin is best remembered for other things, of course. His still-famous Poor Richard's Almanac helped him secure enough financial freedom as a printer to retire and devote himself to the study of electricity. Benjamin Franklin may have been the most remarkable American ever to live: a printer, scientist, inventor, politician, diplomat, and--finally--an icon. His life was so sweeping that this comprehensive biography by H.W. Brands at times reads like a history of the United States during the 18th century. 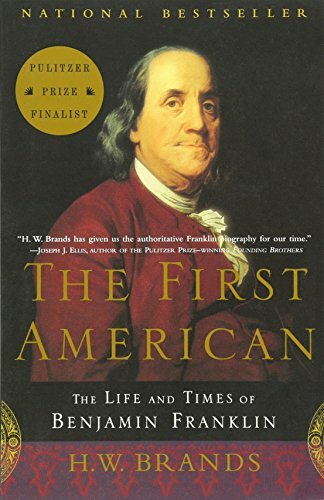 The First American: The Life and Times of Benjamin Franklin tell you the entire biography of Benjamin Franklin. He was one of the American colonies’ great civic leaders, founding libraries, hospitals, and other civic organizations. He was the first to name batteries, and “positive” and “negative” electrical charges, and he invented the lightning rod, the bifocals, and the Franklin stove. In this captivating biography, readers learn the role he played in colonial America. Through easy-to-read text, fascinating facts, and engaging images, children will discover the amazing life Franklin had. This book is perfect for you kids. 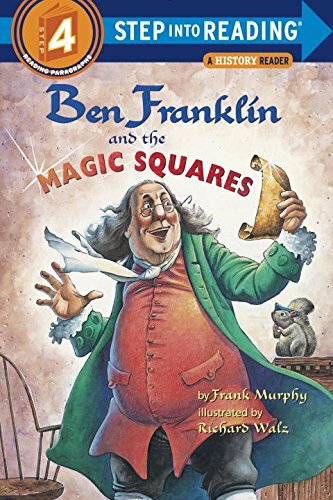 On this book, you will get a funny, entertaining introduction to Ben Franklin and his many inventions and you will know how he created the "magic square." A magic square is a box of nine numbers arranged so that any line of three numbers adds up to the same number, including on the diagonal! It's really a great book and very informative for a young reader. Benjamin Franklin is renowned as a printer, scientist, and diplomat and he has also published more works on religious topics than any other American layperson in eighteenth-century. In his teenage years, he had abandoned the exclusive Christian faith of his family and embraced deism. But Franklin, as a man of faith, was far more complex than the “thorough deist” who emerges in his autobiography. 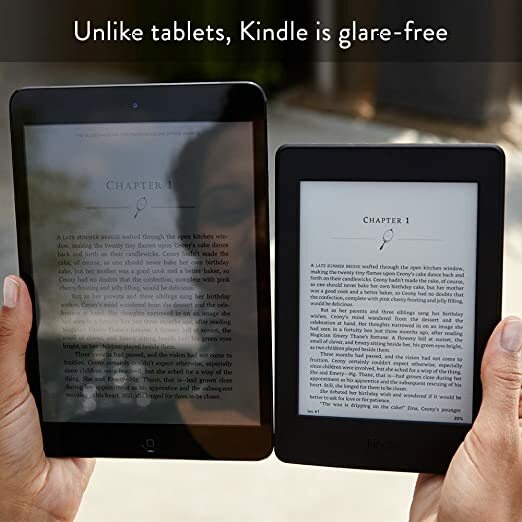 Thomas S. Kidd is the author of this book. He has done an excellent job mining the Frankin papers and drew heavily from Leo LaMay, one of Franklin's best biographers. 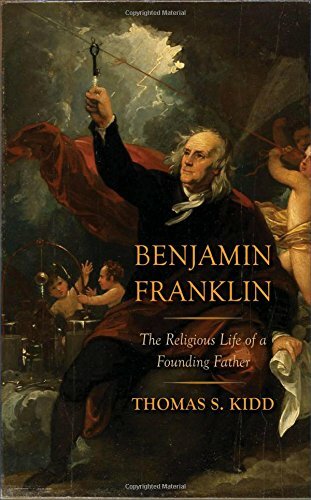 Based on rigorous research into Franklin’s voluminous correspondence, essays, and almanacs, this fresh assessment of a well-known figure unpacks the contradictions and conundrums faith presented in Franklin’s life. From 1771 to his death in 1790, Benjamin Franklin was in the process of writing what he referred to as his Memoirs. Portions of the unfinished work were published posthumously as Memoirs of the Private Life of Benjamin Franklin, first in French in 1791, and then in English in 1793. Today the complete unfinished manuscript is known as The Autobiography of Benjamin Franklin, and is considered one of the most famous and influential examples of autobiography ever written. In the heart of the work, Franklin wrote of his "bold and arduous Project of arriving at Perfection" when he was a young man. He prepared a list of thirteen virtues he wished to perfect in himself, and created a chart in which to keep track of his shortcomings. 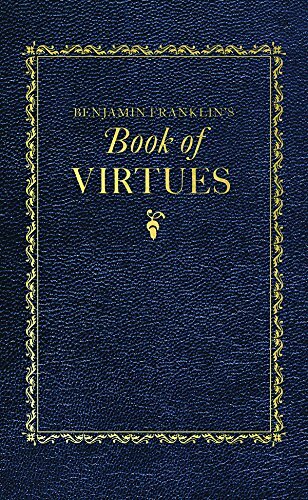 Among Franklin's list of virtues were personal traits (frugality, moderation, tranquility) and social traits (sincerity, justice, humility). Franklin strayed from the virtuous path on many occasions, and discovered perfection was an impossible thing to achieve, but felt a better man for the effort. Benjamin Franklin was one of the busiest men in the American colonies. He was a printer, a postmaster, an inventor, a writer, and a diplomat. When the Revolutionary War began, Ben supported America in the Continental Congress. Like the clever adages from his Poor Richard’s Almanac, Ben Franklin still sets an example for Americans today. No one could have thought up a more amazing character than the living, breathing Benjamin Franklin. He was everything from a "soapmaker, candle dipper, and printer" to a "postmaster, political activist, community reformer, revolutionary, statesman, international diplomat, and first great citizen of a nation which he, as much or more than anyone, helped to create." Acclaimed children's author-illustrator Cheryl Harness through her true-to-life paintings and storytelling-style narrative, along with a generous sampling of Franklin's own words, lets you "walk in his shoes" as you discover just how truly remarkable Benjamin Franklin was. The tenth and youngest son of a poor Boston soapmaker, Benjamin Franklin would rise to become, in Thomas Jefferson's words, "the greatest man and ornament of his age." In this short, engaging biography, historian Edwin S. Gaustad offers a marvelous portrait of this towering colonial figure, illuminating Franklin's character and personality. Here is truly one of the most extraordinary lives imaginable, a man who, with only two years of formal education, became a printer, publisher, postmaster, philosopher, world-class scientist and inventor, statesman, musician, and abolitionist. 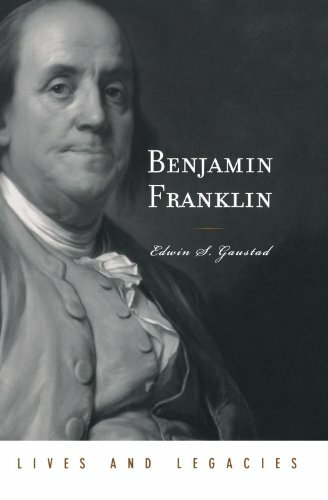 Gaustad presents a chronological account of all these accomplishments, delightfully spiced with quotations from Franklin's own extensive writings. The book describes how the hardworking Franklin became at age 24 the most successful printer in Pennsylvania and how by 42, with the help of Poor Richard's Almanack, he had amassed enough wealth to retire from business. 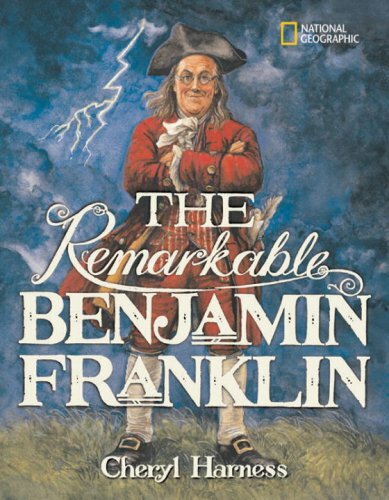 We then follow Franklin's next brilliant career, as an inventor and scientist, examining his pioneering work on electricity and his inventions of the Franklin Stove, the lightning rod, and bifocals, as well as his mapping of the Gulf Stream, a major contribution to navigation. 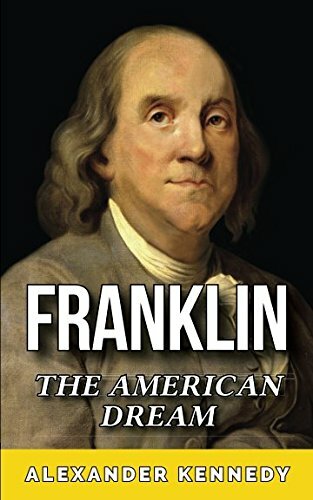 Lastly, the book covers Franklin's role as America's leading statesman, ranging from his years in England before the Revolutionary War to his time in France thereafter, highlighting his many contributions to the cause of liberty. Along the way, Gaustad sheds light on Franklin's personal life, including his troubled relationship with his illegitimate son William, who remained a Loyalist during the Revolution, and Franklin's thoughts on such topics as religion and morality. Written by a leading authority on colonial America, this compact biography captures in a remarkably small space one of the most protean lives in our nation's history. DK Biography: Benjamin Franklin tells the story of the famous statesman's remarkable life, from his early childhood and upbringing through his scientific experiments, his politically active years in the U.S. and France, to his death and legacy. 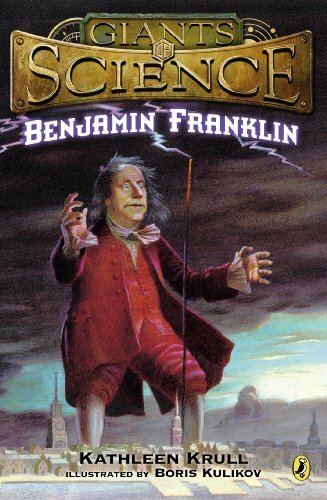 The electrifying biography of innovative scientist Benjamin Franklin is the perfect addition to this outstanding series! Benjamin Franklin is a famous colonial inventor and multitasker who may be best remembered as one of America’s Founding Fathers. But he was also a “natural philosopher” (the term for scientists back in the 1700s), whose experiments led to important discoveries about the nature of electricity—including his famous demonstration that electricity and lightning were one and the same. In a fantastic addition to the much-lauded Giants of Science series, this biography sheds new light on the man who considered science his true calling in life. 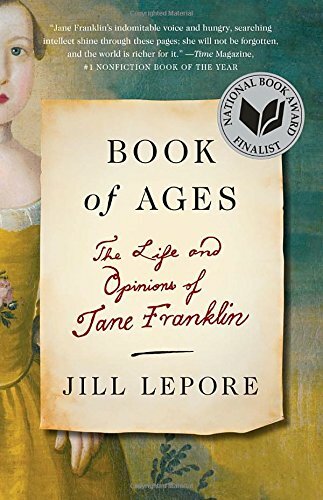 From one of our most accomplished and widely admired historians—a revelatory portrait of Benjamin Franklin's youngest sister, Jane, whose obscurity and poverty was matched only by her brother’s fame and wealth but who, like him, was a passionate reader, a gifted writer, and an astonishingly shrewd political commentator.